Beautifull as always ^^ I love it. You must have had a lot of patience for all those flowers. I am sorry I am a bit behind with my own wall. I was prety ill recently. But this here wall of yours is already making me feel better. You say it's for ruben's b-day? How toughtful of you. I am sure she'll just love it. Lovely wall, I bet rubenz will love it :3 Btw, when it's her b-day? And what a lovely b-day present this is, I'm sure it will be much appreciated! I like what you did with the scan - I didn't read the manga, but I think you made such a lovely wallpaper nevertheless! Hehe, I'm sure you had much work to do with all those flowers... and I like those painted parts on the wallpapers, somehow they make everything look more... artistic. I think the eyes are too blurry, though. It blends in with the rest of her face even though her nose and lilps don't. It's weeeiird. Dx You probably could've vectored the outlines too, and the eye shines are too bright and don't really match the contour of the eyeball. I also think you could be more consistent with where you outline and don't outline things in black. 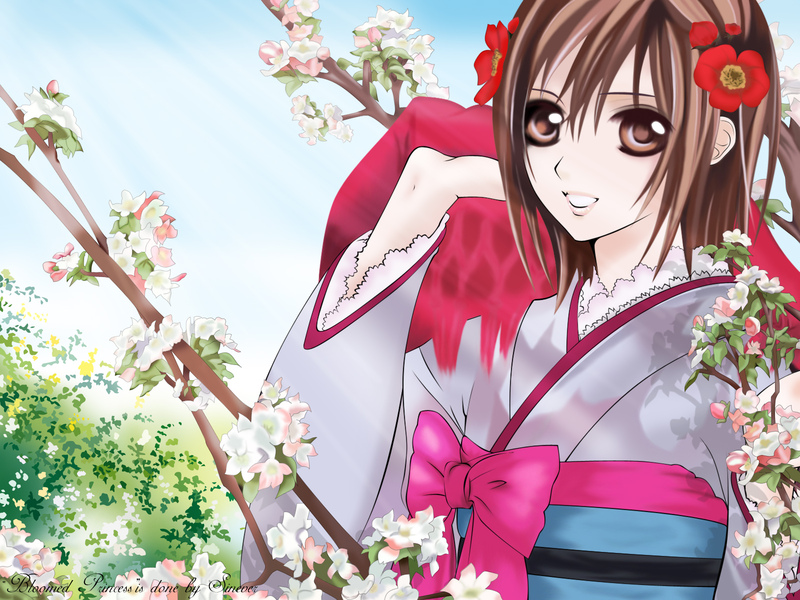 Other than that, I love the details with the bushes and flowers and the shadow of the flowers on the kimono...! this one well ;) I love the kimono! Beautiful! I love the simplicity of the background and of course your vector work is awesome ^_^ Great job! Beautiful good vectoring and I especially like the flowers. Her hair looks too smudged though... Or it might be 'cause there aren't any outlines for the hair. But anyway, still a very nice piece of work! Keep it up! a few things to point out though: first of all, the outline stands out too much, because it's black and sharp while everything else is either brightly-coloured or pastle-coloured, and soft. I suggest using dark brown for the outline, and perhaps blurr it a bit? like chloe-chan said, the hair looks a bit too smudged and blurry compared to the rest of the wall, possibly due to lack of outlines. Same with her eyes. the blanket thing over her shoulder, the two bits that are draping over her shoulder looks over-smudged, so that it loses its texture and edge, and looks kind of odd. the shadows from the flower branches in front of her should be more diffused/blurred, as shadows are rarely that sharp. the bushes on the bottom left corner, although is a good idea, looks too sharp, esp compared to the painted-ness of the rest of the wall. Also, things tend to get blurry as they get farther away if your focal point is in the foreground. So those leaves should be blurrier/less in focus than the girl and those branches to create depth. Queen Sinever is back! Yay! Hello! Congratulations on your new wallie! As expected it's wonderful and very well done! And happy birthday to runbenz too. Wow, Sinever, this is beautiful! Great work as usual! I agree with what Rose has pointed out. But I want to add more, lol. The background, which is the sky, looks a little empty and has that missing-something-sort-of feeling. The lighting looks more like overlayed or blended layers that give a bit like non-realistic lighting. Well, painting is more towards the realistic thing, if you're into scenery, so you might want to add more shadows, and highlights, which will create a stunning lighting effect.